ok, i may or may not have actually won the arm wrestling match, but i did decide i was ready to have a place to "work" and decided to hit ikea up for a few fab items for my new office! Mmmhmm... Ikea.. the land where all dreams come true... It's like Disneyland mixed with Cinnabon & Swedish Meatballs.... glory! 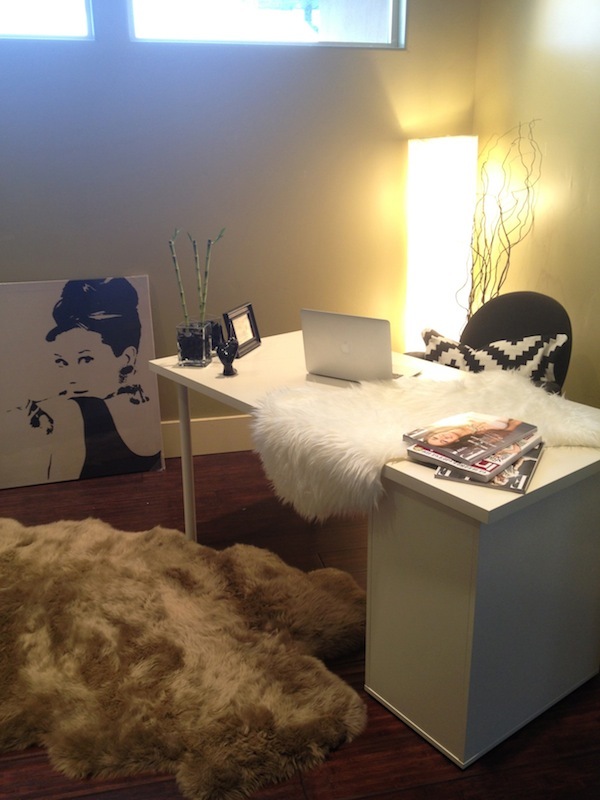 Your office looks fab! I'm loving the space you created. LOVE it! Where did you get that black and white pillow from? So cute and swanky looking. Very clean decor! Love! LOVE the office! I WANT that little peace sign hand! So cute! We have matching desks :) ! I'm loving the Audrey poster. love it. it's coming along great! So cozy and pretty! I'd definitely get a lot done there, I'm jealous of your space! I think this is gorgeous. Beautiful job girly! This looks gorgeous!!! So cozy!